This week, Suzanne and I are in Clinton, NJ, where she is on business for her company. It is about a ten-mile bus ride from New York City. Yesterday, she finished early, so we decided to pop over to see a few sites and soak up a bit of ambiance. We took the bus out to the Port Authority terminal, got our bearings and walked down a few blocks to see the Empire State Building. Along the way we learned that all the traffic signals are merely suggestive for both vehicles and pedestrians. It has become my habit now that wherever I go, I pray. Usually it is in my prayer language (a.k.a. “speaking in tongues”). If there is music in the air, I often sing along rhythmically in tongues, blending it in with the atmosphere. I expect that if anybody hears me, they think I am just singing along. And in NYC, I doubt that anybody will be surprised to hear someone carrying a tune in a foreign language — which, of course, is exactly what I was doing yesterday as we walked along. 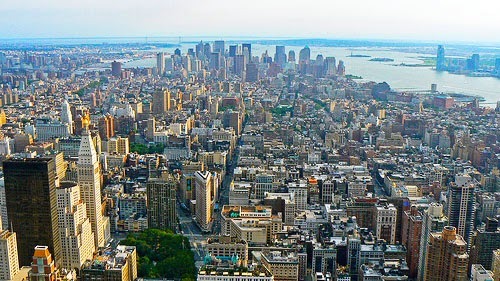 New York City is an interesting place, to say the least, but what it needs more than anything is a revelation of heaven, a revelation of Jesus Christ. As a child of God, I am a fully-authorized agent of Jesus Christ and a distributor of heaven. So as we walked, I prayed as Jesus taught us and called for the kingdom of God to come and the will of God to be done in New York City just as it is being done in heaven. We came to the Empire State Building and joined the tour up to the observation deck on the 86th floor. The view was, as you can imagine, spectacular. We circled the deck, taking in all the angles. I was prayer-walking, filled with a deep sense that God really loves that city and greatly desires to bring it into His wonderful destiny. So what else could I do but get into agreement with the heart of God? When we get into agreement on earth with the will of our Father in heaven, it is indeed a powerful thing. As the day began to wane, we came back down and ate at the Chipotle Mexican Grill on the ground floor, facing out on 34th Street, and watched the passersby. God love ‘em, I couldn’t help but to pray some more, blending my song in with the music playing in the restaurant. After dinner, we headed back to the Port Authority, crossing the streets now like New Yorkers. We walked past peep-show storefronts, praying for the glory of God and the superior pleasures of knowing Him to displace the weak and watery imitation of life that passes for pleasure inside those dingy doorways. Before we reached the terminal, we detoured, just a bit, into the middle of Times Square, where we found ourselves surrounded in a canyon of huge video screens rising high up the sides of the buildings. We were exhilarated by their colorful display. And, of course, I could not help but to stand there praying, in wonder. We made our way up West 44th Street, passing the Shubert, where Spamalot is playing, and Les Miserables at the Broadhurst, and reached the bus terminal. As we rode the 192 back to Clifton, Suz turned to me and said, “You changed New York City today.” I thought a moment about how prayer truly does change things, and I remembered the parable Jesus told, about how the kingdom of God is like a man who scatters seed. He sleeps by night and rises by day, and the seed sprouts and grows, though the man does not know how; he only knows that there will be a harvest. And I realized that Suzanne was right: we changed New York City that day by our prayers. We scattered our seed, and we know that there will be a harvest — that’s how the kingdom of God works.